The Ester “EC” grade product is a Bi-axially oriented transparent polyester film with one-side coated with special chemical. This film is designed to offer superior adhesion performance with various inks and coatings which finally translates into superior inter layer bond strength in laminates. 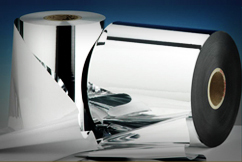 This film when metallised provides very high metal adhesion. The film possesses good thermal, mechanical, optical and surface properties along with excellent transparency and dimensional stability. This film allows achieving higher productivity with low operational wastages in an environmentally friendly process.